Apple's latest MacBook Pro models are things of beauty, but if you've ever wished one of them could be converted into a powerful tablet, there's now a Kickstarter campaign just for you. Modbook announced the Kickstarter-exclusive launch of Modbook Pro X, the company's most ambitious hardware project to date. The Modbook Pro X converts a 15-inch MacBook Pro with Retina Display into a pixel-rich tablet computer. Billed as a "content creation powerhouse," the contraption is meant for creative professionals and casual users alike. The Modbook Pro X can be built from an existing MacBook Pro for a starting price of $1,999 (about £1181, AU$2138), although early backers won't actually receive the modified hardware until early next year. 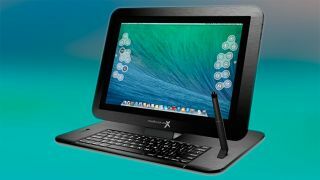 Paired with a pen input device capable of 2,048 pressure levels and powered by the forthcoming OS X Yosemite 10.10, Modbook Pro X can be configured with up to a quad-core 2.8GHz Intel Core i7 processor, 32GB RAM and maxed out with 2TB of flash storage - double what Apple currently offers. Those kind of specs would make even the iPad Air run for cover, especially when Modbook claims the resulting device "functions like a regular MacBook Pro in the Mac ecosystem," even after being converted into a tablet. Modbook Pro X does include a few tantalizing customization options, including Keybars, an eyes-free method for entering shortcuts, and a Keyboard Stand that serves triple duty as an easel mount, keyboard and screen protector. The folks at Modbook have been converting Mac computers into award-winning tablets for years, seamlessly integrating with existing Mac OS X technologies, including Boot Camp support for dual-booting into Windows 8.1 and beyond. We've asked Apple for comment on how Modbook's Kickstarter campaign might ultimately affect the warranty status of a MacBook Pro (don't hold your breath), and whether Cupertino frowns on such modifications (we're guessing they do).